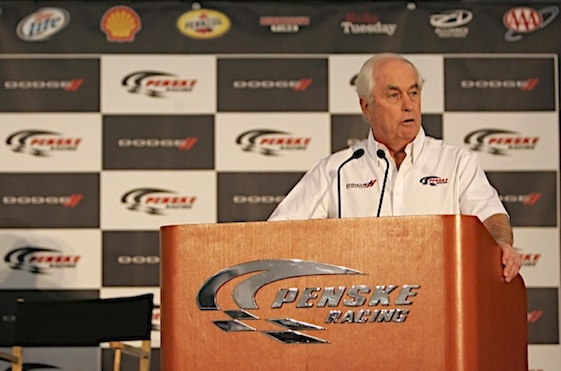 What are all the implications of Roger Penske’s switch from Dodge to Ford? The parties on a teleconference Thursday afternoon seemed to do a masterful job of keeping the suspense in the air. For starters, it’s still not clear just why Penske made the move. And what becomes of Dodge’s participation in NASCAR after this year? It would seem that it would take a team with an experienced engine department to continue on at a competitive level, and with the consolidation of engine building already in place in NASCAR that leaves few alternatives. And how does the addition of Penske affect the pecking order among the Ford teams? Will Jack Roush still be the top dog? Will the money that flows to Penske be new money or will it be taken from the existing pot? Where does that leave Richard Petty Motorsports? 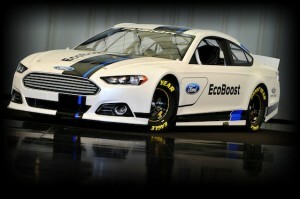 Penske Racing will be racing the Ford Fusion in 2013.
also is without sponsorship for its one-time flagship No. 6 car. Is the economy really recovering, as far as NASCAR is concerned? And how about its media corps? At Daytona, there was talk of even more NASCAR reporters losing their paychecks? Then there’s Chad Knaus’ penalty for cheating the body rules at Daytona. If his Hendrick Motorsports team loses its appeal, what long-term affect will a six-race suspension for Knaus and car chief Ron Malec, plus a 25-point penalty have on the five-time-champion team? Will it bounce back with a vengeance or will it lose the magic? One question that might be answered this weekend at Phoenix is which team had the best off-season. Daytona is in many ways a crap shoot. But you don’t run good on a flat track like Phoenix without some successful engineering behind you. And finally, what becomes of Danica Mania? She’s made her Cup debut on one of her better tracks and was involved in three wrecks in three races. Now what? Will it take on-track success to keep the buzz going? Or will she be like Dale Earnhardt Jr., who remains immensely popular despite scoring just one Cup victory since May of 2006? Have RPM sign with Chrysler. Provide Joey Arrington with the money Penske was getting and go from there!